Arlene Lytle, 89, of Akron, Ind., passed away at 9:47 p.m. Friday May 31, 2013, at Mason Healthcare of Warsaw, Ind. She was born Feb. 23, 1924, in Akron, Ind., to Wayne and Alta (Krieg) Alexander. She was a Burket High School graduate. On March 29, 1947, in Silver Lake, Ind., at her parents residence, she married Vance Lytle. He survives. Arlene was a homemaker. Arlene was always very active at the Akron Church of God. She sang trios and solos as well as teaching Sunday School. 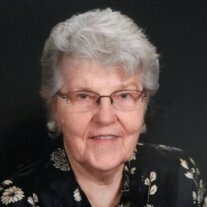 She participated in many things such as directing community bible schools, attending many activities at Yellow Creek Church of God Camp Ground, and she also was a Gray Lady at Woodlawn Hospital of Rochester, Ind. She enjoyed ceramics, oil painting and working with her flowers. She is survived by twin daughters: Sheryl (Walter) Ruegner, Warsaw; Sharon (Terry) Tomlinson, Mansfield, Ohio; son: Randall (Carol) Lytle, Union, W.V. ; six grandchildren: Cory Lytle, Ceridwen Ruegner, Cassandra Lytle, Wes Tomlinson, Shawn Ruegner, Eric Tomlinson; great-grandchild: Carter Tomlinson; sister: Betty Doub, Silver Lake, Ind. Visitation will take place from 5 p.m. to 8 p.m. Monday, June 3, at Hartzler Funeral Home 305 W. Rochester St., Akron. Funeral services will take place at 10:30 a.m., Tuesday June 4. at the Akron Church of God, 301 S. West St., Akron. Pastor Terry Canfield will officiate. Burial will take place in Akron Cemetery, Akron. Memorial contributions may be directed to Visiting Nurse & Hospice Home, 5910 Homestead Rd., Fort Wayne, IN 46814-4202.